Give the gift of wine! Three new selections in every quarterly shipment. 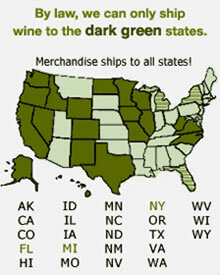 Your recipient will appreciate every shipment of these fine wines, and will think of you each time they arrive. I personally select each wine, write tasting notes, and even tailor a recipe to enhance the pleasure of every bottle. Your recipient receives their first gift shipment about a week after you place your order. Want it to arrive at a different time? Just let us know in the "Comments" section on the last page of the payment process! We include a message with each gift order. After you've added this gift to your shopping cart, simply click on the words "Add free gift card" in the left-hand frame. Be sure to write your message exactly as you want it to appear, and to include your name so your recipient knows who to thank!